Known as the Village of Leicester in 1870, the present Village of Waunakee was started the fall of that year, and formally incorporated in 1893. The Chicago and Northwestern Railroad was extending its line to St Paul at that time and officials of the railroad wished to locate a station in the area. A spot near the mill (located at Woodland Dr./Bong Road, intersection of Sixmile Creek) had been chosen. Located just two miles from the center of the present Waunakee, the railroad saw it as an excellent location. Two early settlers, Mr. Lewis Baker and Mr. George Fish, owned land along the new railroad line and plotted a village on their property. In exchange for $1,500 and two miles of right of way, railroad officials changed their original plans and trains roared to a stop in what is now known as Waunakee. The original plat of the village was dated January 30, 1871. The post office was moved from Lester to Waunakee sometime in 1872. The first building erected in town was a house on Second Street, built in 1870. The first business place was a general store built on Main Street by Mr. Fred Bublman in the summer of 1871. In 1871, the Baraboo Air Line Railroad teamed up with the Chicago and North Western Railroad (C&NW) to negotiate where the railroad line should go from Madison, Wisconsin to join with the Mississippi River. After hearing some disputes from the two railroad companies, four Waunakee area landowners, George Fish, Lewis Baker, Ira Bacon and Solomon Martin, donated two miles of the right-a-way and paid $1500.00 to the railroad company to build the Station and allow the railroad to come through. In 1871 the first depot was built and soon became the focus of a thriving agricultural economy. Farm products such as livestock, cream, tobacco and grains were shipped from the depot. In 1892 a fire that spread through Waunakee destroyed the depot but a replacement was built in 1896 and that building remains today. Throughout the years seven or eight agents manned the depot with Mr. Hubert L. Reeve serving for 50 years. In 1925 the Waunakee Tribune reported on the depot: “The depot is receiving a coat of paint, grey, trimmed with brown. This is probably the closest we will get to a new depot, which has been promised.” At one time 60 trains passed through Waunakee daily, 14 of them passenger trains including the famous C&NW “400”. In recent years several trains pass through town most days. Passenger service was discontinued in 1963 when the last passenger train, number 519, departed from Waunakee. The depot closed for good when Bob King, the station agent locked it for the last time in 1971. In the mid 1970’s the Waunakee Arts Council spearheaded an effort to restore the depot to its original condition. Local volunteers and the Seabees of Madison Naval Reserve Center made needed repairs including a new paint job and replacing the roof shingles. 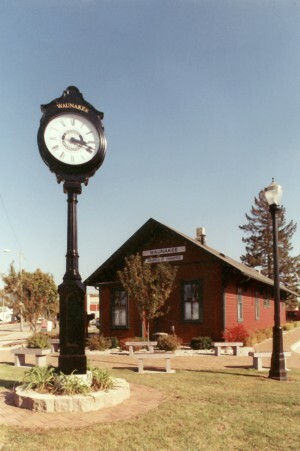 In 1977 the depot was purchased from the railroad for $12,000. Funding was in the form of a gift from Mr. Bob Reeve, a son of the early agent Hubert Reeve. In 1978 the depot and the grounds were dedicated as “Reeve Park” in memory of the father and son. Also that year, the depot was placed on the National Register of Historic Places. In 1995, through the efforts of many interested residents, the depot made its home on a new foundation that was built on the park grounds. Today it is home to the Chamber of Commerce office with hopes of someday also serving as a historical museum. The Waunakee Society of Model Railroaders displays a 1950’s layout depicting the Chicago & North Western Railway from Madison to Rock Springs in the lower level of the depot. The society works on the display the second and fourth Wednesday of each month from 7-9 pm. For more information about the Railroad Society, call Allen Hinck at (608) 849-7703.